Planet of Finance, the world’s largest online community dedicated to the wealth management industry, has annouced the launch of Planet of Finance 3D, a unique marketplace connecting wealth managers with investors and peers. For investors, it’s a powerful free tool to connect with wealth managers and financial advisors 24/7. Investors can approach and speak with any registered wealth manager, seeking the insights they need to make smart choices on how to look after their money. The permanent marketplace has already attracted some of the biggest industry names including: Bordier & Cie, Indosuez Wealth Management, IG-Bank, IRISOS SA, Lombard Odier, Notz Stucki and Union Bancaire Privée, all of which investors will get direct access to from 3rd April. For wealth managers, Planet of Finance 3D slashes the cost of customer acquisition. Wealth managers can design virtual booths with customisable messaging to attract prospective investors. They can then share videos, brochures and business cards and answer queries from potential prospects via chat or Skype calls. Planet of Finance 3D also allows professionals to connect with peers in order to find business partners, expansion opportunities and more. Both investors and professionals will also benfit from regular digital events dealing with the main themes and trends in investment and the wealth management industry. Planet of Finance 3D will be running a core event programme for private individuals and professionals on different topics such as robo-advice, crowdfunding, technology and asset allcoation. Banks and exhibitors will also be able to host their own events and broadcast live videos from the auditorium. “Planet of Finance 3D offers a real opportunity to explore new ways to connect with prospects and peers at any time. We see this platform helping us to attract younger, tech-savvy clients who have not previously had the time or passion to explore wealth management options. 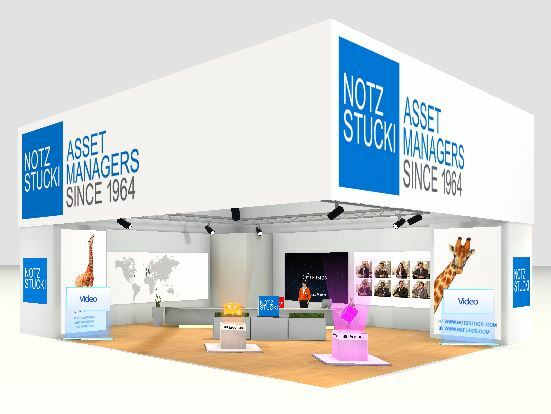 The 3D marketplace will also allow us to build relationships and share solutions with other finance professionals”, commented Antonio Mira, Group CFO at Notz Stucki.